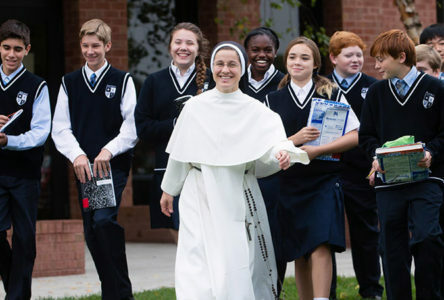 St. Thomas Aquinas Regional School was founded in 1977 and is administered and staffed by the religious community of the Dominican Sisters of St. Cecilia and a lay faculty. It serves over 510 students from pre-kindergarten through eighth grade and three Arlington Diocese parishes: Our Lady of Angels, St. Elizabeth Ann Seton and Sacred Heart. It has a diverse student body with over 20 percent of the students speaking one of 17 secondary languages. The dedicated Aquinas faculty and staff have developed several programs that enrich the curriculum such as a unique Science, Technology, Engineering and Math (STEM) program in partnership with the John Hopkins University Center for Talented Youth, an Advanced Language Arts Program, a Math Enrichment and Student Support Program, as well as performing arts programs in both music and drama.